sassyfrazz: Umi Shoes: Review and Giveaway! Umi Shoes: Review and Giveaway! Since Madelyn is such a shoe fan, I am always on the look out for great shoes. Not only great for looks (which is what Madelyn is mostly into right now) but for comfort and function. Umi makes adorable shoes for children, and their shoes are made to last! At Umi, we build real children's shoes. Not floppy leather slipper socks. And not miniature grown-up shoes. We know a lot about growing feet. Front to back. Side to side. Top to bottom. 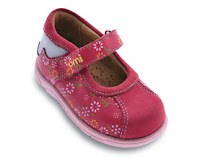 Umi shoes are designed with children's feet in mind. Around here we have some pretty high standards. We craft our shoes from the highest quality nappa and nubuck leather, with carefully constructed lasts. Our manufacturing process includes more than twenty quality control checks to ensure that every pair of shoes meets our standards. The result: Umi shoes are flexible, supportive, built to fit, and go the distance. I think that the qualtity is superior and they really make great shoes! 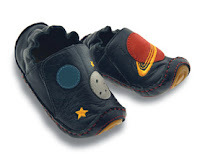 The leather is soft, the Velcro straps are strong and durable, and the shoes are flexible enough for little walkers. I am excited to see how these shoes last through the miles Madelyn will put on them. I think they will outlast Madelyn's use. Umi's shoes come in several sizes for baby up to children's sizes. Sizes are in European sizes from infant 17-children size 38. The prices range from $40-$105 and the quality is what you pay for. The shoes are made with nappa and nubuck leather, which makes the shoe last. There are so many styles of shoes for baby, girls and boys with picks from summer shoes, dress shoes, or tennis shoes. Another bonus about Umi shoes, is they use only non-toxic materials that are built to last. Their drum-dyed leathers are tested for colorfastness and wear-resistance. Umi packages their shoes in recycled materials and uses environmentally sound practices to manage waste. At Umi, making a safe, healthy, earth-friendly product is not trendy...it is who they are. Would you like to win a pair of Umi Shoes? Umi has offered to do a giveaway for my readers! This contest is open to all readers living in the Continental United States. To get your first entry, go to Umi's website and pick out the pair of shoes you would like to win (if you are the lucky winner). If you do not do the first required entry, you will be disqualified. You may come back each day and enter (again) after you do the first rule, just tweet about this giveaway and leave the url in your comment OR Click here to see how you can earn even more extra credits to win!! Click here to see guidelines and the official rules. Contest will end on February 17, 2009 at 11:59PM CST. GOOD LUCK! Such a hard decision-they are all so cute! I really like the Tabitha, thanks! I'm a reader subscriber, thanks! I really like the Carousel sandals for my niece. Thanks! My favorite shoe is the Carousel. I like the Riley pair. Thanks for the chance. THese are so cute!! I really like the Riley ones!! this is a hard decision. I like the Brazos for my son and the Selenia ones for my daughter. This prmotion has been featured on Sweepstakes Advantage: http://www.sweepsadvantage.com/search.php?keyword=sassyfraz . I love the Puzzle ones!!! I hope I win the Camellia shoe in chocolate. These shoes at this store are so adorable. I love the Sycamore boys shoes. Okay Sarah, I am back for another entry for today!! The Urchin would be cute for my niece. Thanks. They are all so cute! One of my favorites is the Lucy-adorable! Trek would be perfect for my little boy this summer! I really like the draco...very unique and cool. I love the tess sandle they are so cute! I love Umi shoes for my 3yo! My favorite current style is the Tabitha sandals. Thanks! I love the Tea Party in red! These shoes look to comfy. Thanks again. I want these shoes for myself! I love the Begonia or the Riley. So cute! I love the bugaboo shoes, so unique! These are great. thanks for the giveaway. My nephew would be really cute in the Riley shoes! I love the 'action' boy shoes! I love them all and could only narrow it down this much: either the Tess or Tabitha in chocolate for this summer, or Begonia in chocolate or Selenia in cream in a bigger size for the fall. Thanks for directing me to a great site! Love those shoes! I like the Riley-brown-size 24 for little LJ. I am so picky about by boys' shoes! Thanks for the opp Sarah! I like the Scribble sneakers. I just love the Lucy sandal! Too cute and would go with everything. what awesome shoes! it was hard to pick just one...but i love the begonias in brown!! Oh boy how to choose?? The Selenia are really pretty. I love the Lauren in Fuchsia or the Enchanted in Pink. Thanks for entering me! I think the Sofia is beautiful. Thanks for the chance! OMG! I love, love, love the Riley in chocolate. So cute! I'd like to win the Urchin. I would love to win the Tabitha. So cute! Love the Action in blue!! I like the Lucy shoe! Thank you! I like the Selenia shoe. Thanks for the giveaway! I love the Maddi shoes. I would love to see Roo in the Enchanted slip ons... in every single color they come in! I would love to have the Maddie pair for my little girl! Thanks for the chance! Love the Riley and Begonia. I think the Tabitha are just soooo cute. I like Potpouri in soft yellow! Our favorites are the Draco little boy shoes. Thanks for the giveaway. I love the Lyric boots! The Ada shoes are really cute! Thank you! I really like the Adore boots. I really like the bo peep shoes. these are adorable. I love their shoes! I think I would choose the boys Bugaboo. I blogged about your giveaway!!!! I would pick the Sycamore for my grandson. I like the Riley shoes in chocolate/tan and in chambray print. I like the Glory sandal! Thank you! I like the Hopper for my Hopper ! Love the Freya or Lauren in white. I would LOVE to win a pair of the "Sweetgum" ankle boots for my granddaughter. They are just precious - chocolate brown and pink! Do you have a way for me to subscribe by email? I'm not a blogger, but I really like your blog site. i like the Action in chocolate. So many great looking shoes to choose from. I really like the Wourstad. The Lucy is super cute! Thank you! No doubt about -- the Sunshine sandals in soft blue are where it's at!!! Now that my little girl (14 mos old) needs shoes with tougher soles, these would be perfect for the upcoming warm months. My little girl would be over the moon if we won a pair of Enchanted. Thanks for introducing a great choice in shoes for children. The Selenia in cream--would have to measure my daughter's foot for the size! I love the Geneva in size 24. I love all of them though! I dont know if I want to win more for my daughter- the ithica, or my son, the sail!! They are all so nice!! I would love to win the flutter in fuchsia for my daughter!! I love the Draco. We had a pair of UMI shoes when my son was little and we got SO many compliments - more than on anything else he owned. They were the greatest. I love the Bugaboos. Thanks!! The Bugaboo shoes for sure! I love the Tess sandal!! Thank you! i would love to win the WOURSTAD in black, size 23! It's really difficult to decide between the Bo Peep and the Sweetgum. I guess I pick Sweetgum. They are all very cute! I'd love to win the white Freya pair for my daughter. Thanks. the lyric boots in a size 31. these look so cool! i wish they had the baby styles in bigger sizes...my son's a toddler with big feet. anyway, of the sizes he can fit, i love the bugaboo in navy. Its hard to pick, but I like the Riley shoes. I really like the Urchin shoes! Just back for another entry! back today, would love to win shoes for my daughter. I'm sticking with the "Sweetgum" shoes for my granddaughter. I HAVE to win a pair for her because I won a pair of See Kai Run for her older sister and now she won't speak to me on the phone! Back today, need to win these for my daughter. I love the boys trek sandals in chocolate/tan! The Suze sandals are my very fave!! If I should win I'd pick the Action in the Chambray Print for my son! The baby shoes are adorable!!! Thanks for the giveaway! I would love to win the "Urchin" shoes in chocolate for my son. Those shoes are too cute for the summer! These are so adorable! I like Freya for a shoe and Glory for a sandal. The Tea Party shoes would look so cute on my little one! Thanks! Love these shoes! My favorite is the Riley design for my oldest son in size 31. Thanks! I like the Action shoes! I would love the Paisley in Raspberry. I would like to win the Urchin sandals. Thank you! my choice would be the Jet or Draco - if those are too expensive for the win I'd choose another though! Tess in pink is very cute. I'd choose Lauren, Fuchsia, size 31. I love the Riley. I'd love to get some for my son. And we live on Riley Ln. How fun would that be? I really like the Valentine shoes! They have some really cute shoes, I would choose the Trek. They look nice and comfy. I would choose the Ada pair in white. but I must tell you, it was a hard desicion! I loved nearly every pair. I'd love the Brise for my little girl! I love the flutter sandals! Lumen is my favorite. I love stars and these are so cute! Thank you. Gaming Fun from EA ~ and a giveaway! "A Little Help From My Friends" DVD Giveaway! See Kai Run Shoe Giveaway! You Can Make This $50 Giveaway! “Suavenomics – living beautifully for less” Test!